From wanting Kanha’s Matki to relishing his favourite Mishti-doi, the advertising world came together to celebrate ‘GopalKala’ being their creative best. Lord Krishna’s birthday aka Janmashtami paved the way for brands to take a break from obsessing over Radhika Apte memes and amalgamate some creativity in the festivity. There is no single festive occasion that goes unnoticed by brands wherein they go all out in crafting various creative posts and videos for latching onto the aesthetic opportunity and play around it. 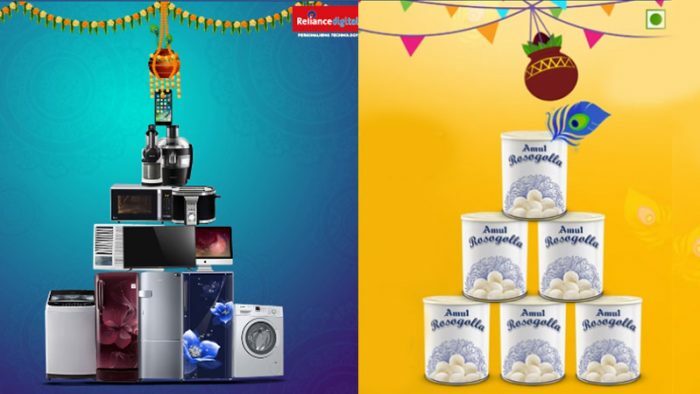 From Amul to Mother Dairy to Big Bazaar, brands have poured in their wishes creatively on social media celebrating BalGopal’s birthday with a few of them also cashing in on ‘exclusive day offers’ for their consumers. A neighbourhood becomes a better place when its people join hands to achieve great things. This #Janmashtami, let us celebrate the spirit of communities that live and grow together. Also Read: Brands grab on to the viral Radhika memes to engage with consumers aptly! Celebrate Janmashtami today, Higher Returns & Low Interest rate everyday with #PaisaDukan. #HappyJanmashtami from our family to yours! Which one’s your favourite of all these Janmashtami brand creatives? Let us know in the comments section below.